Factotums are humanoid mechanical constructs created by Sotha Sil. They are often found within the Clockwork City. Most of the time they have female voices. Larger and more powerful variants, such as Imperfects, can also be encountered. They appear in both the Morrowind Chapter and Clockwork City DLC. These NPCs will be friendly in Brass Fortress, and hostile in most other locations. 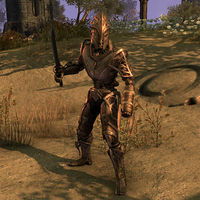 Factotums added in Update 14 originally had a much more different appearance, consisting of smooth cone-shaped heads with no holes at their masks, chestplates with large pauldrons and different patterns, clunkier arms and legs without any thin pieces of metal protruding, and much pointier boots. Following the release of Clockwork City in Update 16, the appearance of all factotums was updated and the older Factotums established to be discontinued models known as "Era 1 Factotum". A Factotum polymorph is available. This page was last modified on 24 July 2018, at 08:27.